Volunteer at 18. Retire at 38? What’s next? Anderson enlisted in the United States Air Force after graduating from high school. She hadn’t planned on joining the military, but without a life plan, and belonging to a military family, signing up made sense to her. She thought she would serve a few years, find direction, learn a trade and get out. That was 18 years ago. And now, two years from retirement, Kathleen recognized the need to start planning the next phase of her life. For a majority of her Air Force career, Kathleen has served as a resource manager. While she has enjoyed her work, she doesn’t have a passion for continuing this work outside of the military. Currently, Kathleen serves as a squadron superintendent doing human relations work. 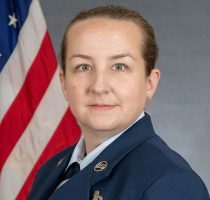 She’s responsible for over 50 airmen serving as financial managers, safety personnel, chaplains, legal personnel and more. While she also enjoys this role, it’s not what she wants to pursue outside of the military. When Kathleen began searching the internet for direction, she considered several options. An MBA? Teaching? But neither excited her. That’s when she stumbled upon GW’s Master’s in Political Management program. Kathleen earned her B.A. in Political Science from American University years ago, because even when she was young, she had a deep interest in American history and government. As she searched for what to do, she settled on pursuing a future in politics. “I really want to be that positive agent for change,” she said. When Kathleen started her coursework, she discovered very quickly that she was the only student with zero political experience. As an active member of the military, she was not allowed to be politically active other than her civic responsibility to vote. While her classmates already had experience in politics, Kathleen was working off of a blank slate. This may seem like a disadvantage, but Kathleen is thriving in the program and providing a different view of the world, politics and possibilities. “One of my professors has mentioned several times that due to my lack of experience, I offer a unique perspective from my classmates,” Kathleen said. Many members of our military, such as Kathleen, are not strangers to distance or online learning. Due to frequent travel or deployments, online education is the only plausible option for active service members. Pursuing a degree while maintaining a military career and family obligations can be challenging. Choosing a program with an intuitive, easy-to-follow platform can contribute to your success.